A Rocketplane Kistler K-1 cargo vehicle bears down on the International Space Station in this artist's illustration. NEW YORK - Twocommercial firms in the U.S. and Japan are teaming up with hopes of ferryingexperiments and other cargo to a planned Japanese laboratory at the InternationalSpace Station (ISS). TheOklahoma-based Rocketplane Kistler, Inc. and Tokyo's Japan Manned Space SystemsCorp. (JAMSS) have signed a Memorandum of Understanding to develop commercial launchsupport for Japanese users of the space station'sKibo laboratory. The firms announced the deal Tuesday during a SpaceInvestment Summit held here near Wall Street. RocketplaneKistler is developing its K-1 reusable rocket and cargo module as part ofNASA's Commercial Orbital Transportation Services (COTS) program to spur thedevelopment of private cargo and crew delivery systems for the ISS. The firm issharing a $500 million NASA award with fellow COTS contender Space ExplorationTechnologies (SpaceX), which is developing its own Falconrocket family and Dragon crew capsules. 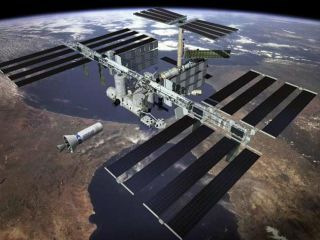 CharlesLauer, vice president of business development for Rocketplane Kistler, told SPACE.comthat the deal will hopefully lead to ISS-bound launches in 2009 once allcomponents of the Japan Aerospace Exploration Agency's (JAXA) Kibo laboratoryhave been installed at the space station. "Havingreadily available commercial transportation services to the ISS for both upmassand downmass is critical to attracting users for Japanese investment in ISSfacilities and resources," Kazuhide Todome, JAMSS managing director, said in astatement. "The K-1 launch vehicle shall provide key services to JAMSS and theISS user community." Lauer saidthat about 30 percent of Japan's Kibo laboratory assets are expected to beavailable for commercial users, though JAXA officials said Wednesday that theycould not comment on the future plans of private firms with an interest insupplying their orbital laboratory. Any commercial supplies are envisioned tobe launched inside K-1 cargo compartments that will resemble those found on themiddeck of NASA's space shuttles, he added. JAXA's Kibolaboratory consists of several components, but at its heart is the 37-foot (11.2meter) long Japan Experiment Module (JEM) Pressurized Module. Slated for launchin April 2008 aboard a NASA shuttle, the pressurized laboratory will be thelargest science module to be installed at the ISS. Adding toKibo's pressurized laboratory is the Experiment Logistics Module, a pressurizedcompartment that will serve as an orbital storage area for tools, supplies andother equipment to be used inside Kibo. A dedicated robotic arm and externalscience platform, designed to expose samples to the space environment, roundout the Kibo laboratory. Kibo'sExperiment Logistics Module is slated to launch in February 2008, and was welcomed intoNASA's Space Station Processing Facility at Florida's Kennedy Space Centeron Tuesday.